The Motorola Moto G6 Play is the humble cousin of the G6, with very similar aesthetics except for the glass back. The smartphone, being budget friendly, has a decent processor in the 1.4 Ghz Qualcomm Snapdragon 430, average battery, 4G connectivity and comes with the usual Moto customisations. The G6 Play is an average phone that easily fulfils all your basic smartphone requirements. But since it is a low end device, many of its features are below par and it fails to give tough competition. The camera delivers grainy and over exposed images, operational lags, and pixelation and dull colors can dampen the experience of using the smartphone. It is not a phone for gamers; so gaming addicts may want to switch to more powerful options. If you’re looking to sell your old Motorola Moto G6 Play and want to fetch yourself a good price, Cashify is the all-in-one website you’re looking for. Why Sell Your Old Motorola Moto G6 Play On Cashify? Cashify is a trusted name with over 9 lakh satisfied customers and 11 lakh gadgets encashed till date - a safe haven for all looking to rock the latest tech while simultaneously desiring a good deal on their old purchase by selling old phone online . A hassle free online portal, Cashify allows you to conveniently sell your used mobile phones and gadgets with an assurance of receiving the best rates in return. The credibility is worth noting with Cashify's exclusive partner brands like Vivo, OnePlus, Xiaomi, Motorola, Apple, Samsung, Amazon, Croma and many others. 1. 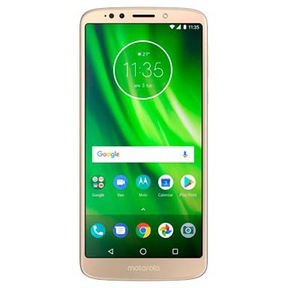 Go to Cashify website and enter your phone's brand name and model - Motorola and Moto G6 Play, in this case. Next, answer a few questions regarding the current condition of your phone, its warranty period and more. 2. Cashify will use its automatically generated pricing algorithm to come up with a transparent and fair price for your old Moto G6 Play. Cashify can help you get best prices for your used Motorola Moto G6 Play. 3. If satisfied with the price, proceed further and choose the time and place of the free pickup you want to schedule. 4.Our representative will visit you at your designated time and place. You will be paid in the mode of payment of your choice in exchange for your old smartphone. Cashify gives a convenient marketplace to all the used and old gadgets and smartphones. Be assured of the best prices at a few clicks in the convenience of your home.